The Barbary macaque (Macaca sylvanus) is one of the most recognizable of the old world monkeys. Moreover, they are the only primates, aside from us humans, that live freely in Europe (though, as indicated by their name, they are indigenous to the northern regions of Africa). That distinction has evidently led to this monkey feeling quite uppity. I think I would flourish as a Barbary macaque. They live in matriarchal troops of 10-30 individuals, but unlike most other primates, the males play a prominent role in the rearing of the offspring, and spend much of their day grooming and playing with the little ones. They form strong bonds with both their offspring and those of others. In fact, it seems that the females prefer highly parental males. One of my few talents is being a daddy, so I think I'd fit right in. 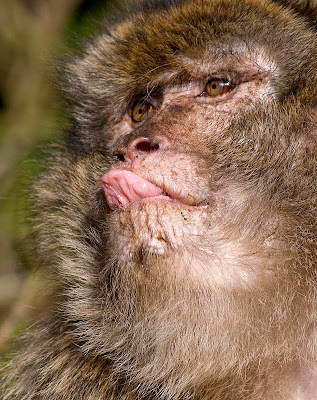 I am now sticking out my tongue in solidarity with my macaque brethren.